Thanks for the detailed discussions and opinions on knots. My two pence on the matter: the reason for using either the bowline or the figure 8 knot, is a rope in tension will always break at a knot. 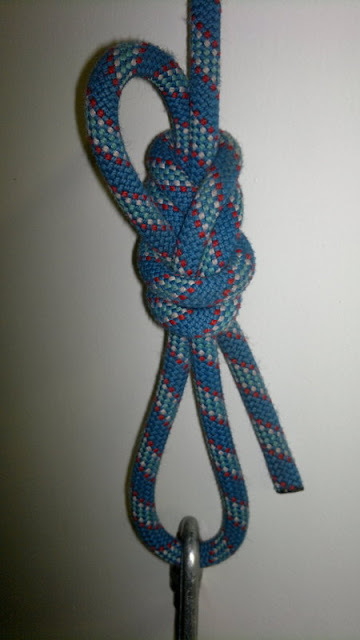 Knots significantly reduces the breaking strength of a rope. The Bowline and the figure 8 knot are the only two knots (that is practical for climbing) that maintain 0.8 (or 80% if you like) of the rope strength, other knots bring with a much greater reduction in breaking strength. So, technically they are equally good, it is simply a matter of personal preferance. A good knot is one that does not let any light through, someone once told me.. It seems knots are in the news. What do you climb with? What are your thoughts on "Figure8" vs "Single Bowline" vs "Double Bowline" vs "Granny Knot"
And "Fishermans Stopknot" vs "Jacks Variation Stopknot"
Is that double bowline the same as the Yosemite Bowline? Although I must say I think I am going to revert back to the Fig 8...Much easier to tie in difficult situations and harder to bugger up. Cuan, it's not the same. The Yosemite will count as single bowline. The double bowline basically starts with 2 loops instead of 1. I don't really see why you'd want to do that. What is "Jacks Variation Stopknot"? Yeah, see that now. I don't get the point of the double. But the Yosemite is really nice. I'm sold on the Fig-8 (tied with a bit of a tail) for both sport and trad. It is slower to tie than a bowline but is easier to teach and check. You don't actually need to tie the tail of the Fig-8 off with a stopper knot, the reason that it is taught that way is to make it clear that you need to tie it with a tail. A bowline does however need a stopper knot. In fact if you stuff up the bowline, the stopper knot could save your life. shorti wrote: Cuan, it's not the same. The Yosemite will count as single bowline. The double bowline basically starts with 2 loops instead of 1. I don't really see why you'd want to do that. The Bowline (to me ) is a slightly more technical knot and if you get it wrong you're in trouble, the Fig of 8 is more forgiving if you mess it up - chances are it will hold anyway. Fig of 8 for trad (because Bowlines have been known to work loose over time). A standard bowline will come undone less easier than a Double or Yosemite Bowline, tying the tale off is always recommend (not always done). When threading through the anchors on sport routes: I thread, then tie a double Fig of 8 (on a bight) and clip in using an autolock biner – makes things quick, easy and simple. Last edited by Marshall1 on Thu Mar 31, 2016 9:02 pm, edited 1 time in total. After our conversation at Oudshoorn about Jack Parrow I figured you would have mellowed out a bit. 2) Fig8 with Jack's variation. All the accidents with Bowlines. 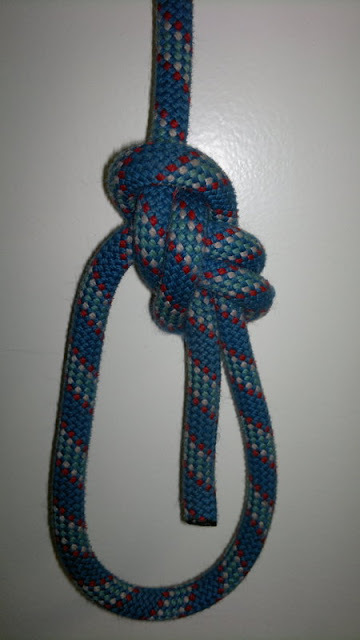 Is there any record of a Bowline failing if tied with a stop-knot? Should one be able to upload photos from iPad? I use the reverse granny for trad and sport. in other words the same knot you would use for joining tape slings together. its quick, neat, tight, easy to untie and wont work itself loose. if you take a big fall on an 8 it takes for ever to undo and bow lines look to loose for my liking. Last edited by Marshall1 on Thu Mar 31, 2016 9:01 pm, edited 1 time in total. that's the one, although we add a 6'th step in taking the tag end and sticking it back down through those two bottom turns as well. Cinches up nicely then. personally i stick to the fig8 + dblfishermans stopper, but when I project something on sport and know I will fall a lot then I do the double bowline with a stopper (spending time to make sure the knot is made proper. both still have plenty space left to fall on. just make sure you know the know you use, how to do it right, and its limitations. Bowline re-thread for lead, Fig-8 on toprope and when cleaning routes. Being used to a bowline for sea rescues for years, I am very familiar with the bowline and it is something I can do with one hand and I am thinking you don't have to do it before you thread it like the fig 8. Might be fun to use when cleaning if you use the yosemite bowline? Have never considered using it for climbing funny enough, been taught to use the fig 8 with fishermans. I am curious about the yosemite, but am nervous curiosity may kill the cat. I use the method described by Cuan for the Bowline with Yosemite backup where you send the end through the lower loop again. With this method it's almost impossible to untie it by accident. I use it for trad and sport. This backup makes it fool proof. It also increases the radius of the first bend which theoretically increases the knot strength. I use Jack's variation on the Figure 8 when using a oldish and hardened static rope that tightens easily. For instance when belaying people at the Exploratio climbing wall when newbs (like me) hang on it forever. I however do not pull the dead end all the way through. With this method, you can just pull the loop out and you have some slack. Even if the loop pulls out while climbing, it doesn't undo the knot. Last edited by dirktalma on Tue Apr 24, 2012 9:34 pm, edited 2 times in total. I would not consider myself an elder, but i know where you are coming from with the ocean and the bowline. - you can make it with one hand while keeping your head above water with the other. - in how much of a hurry am I to tie in before a climb? - do you trust myself enough (be careful for deceptive ego) to tie in without supervision / another climber checking you? - do you intend to project routes and take repetative falls in one go that can tighten up a knot? I like an approach where I reduce my risk and increase my chances of coming back again, and again. all other scenarios fig8 + stopper. I think full score is to build a personal relationship with whatever knot you use, being familiar with its pros and cons, and then applying a little bit of risk management. - I prefer to develop a personal relationship with ANYTHING really except the ground. Rapid deceleration syndrome is not really for me. - I was thinking of using the yosemite when cleaning, to avoid the fig 8 and delay in threading. And simply cuz it is quicker to make, and even that was just a consideration based on what I've read here today. I am very risk averse, so I would need 20 elders to confirm first. Knot to use when cleaning (I know this has been mentioned somewhere before, probably in this thread but it bears mentioning again): Many routes (thanks to ARF) have large rings at the top. When you get there, clip into both bolts with slings/draws/cowstail. Then pull up a bight of rope, push it through (both) the rings and tie a Fig-8 on the bight. Clip this to your harness using a screwgate. Untie the rethreaded Fig-8/bowline from your harness and voila you are now able to be lowered to clean without ever having untied from the rope. The way I see it, there's 2 things that can go wrong with the bowline. Both when the knot is loose. First the obvious one is the end of the rope simply pulls out. The other one is hard to explain so I'll use the rabbit, hole and tree story. If it is loose enough, you can basically pull the tree through the hole and then you're buggered. This is obviously kinda hard to do if the tree is stiff (when you weight the rope) and therefore very unlikely to happen in my mind. The various stopper knots makes it hard to do even if there's no tension on the rope. The Yosemite works just fine. I found it pretty much impossible to fail it even with a loose knot with no tension (basically trying to pull it through with my fingers). I could still manage to pull the tree through the hole with a rethreaded bowline, but it was much harder and it doesn't look like it will fail instantly like the single bowline in any case. No chance for the tail pulling through the knot. So the Yosemite looks best to me, as it is easiest to tie and prevents both potential failures the best. Just using the plain bowline is asking for trouble. Disclaimer: This isn't very scientific, it's just from a discussion (with rope handy to test) with my dad who's got quite a knack for knots. Nic, that sounds interesting, I am liking that way. By screwgate I assume you mean locking bina right?